BIVIO is a unique Slovak project organised by ZPMP SR (Association for the Help of People with Mental Disabilities in the Slovak Republic) with the aim to link the provision of services to the public with the preparation of people with mental disabilities for employment. 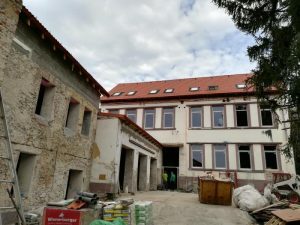 The goal of the project is to build a centre that will provide people with mental disabilities with opportunities to undergo practical training and get a qualification in three main areas: the accommodation services, catering services, and laundry services. In order to make BIVIO financially sustainable in the long-term, the centre will include a pension, a restaurant, and laundry service, all open to the public. This will allow the centre to accumulate the finances necessary to keep the training of people with mental disabilities free. On top of the three commercial establishments, the premises will also include a centre for rehabilitation and education, where young people with mental disabilities will be prepared for professions such as assistant cook, maid, waiter, or laundry worker. It goes without saying, that finding the space for the realisation of such ambitious project was not easy. The organisers eventually decided for the premises that were once occupied by a school in Bratislava’s neighbourhood of Rača. However, as a result of abandonment, the buildings fell into partial ruin and the reconstruction turned out to be costlier than what was originally expected. Since their budget was limited, the organisers opted for reward-based crowdfunding in order to gain the required resources. The campaign was set up on Slovak platform Startlab, where it raised 6088 EUR out of desired 20, 000 EUR. Considering that the campaign has used the Keep-it-All model, it can be considered a success, however, the campaign realisation has certainly confirmed, or at least shown, the capacity of Slovak crowdfunding. There are two main reasons for the campaign’s inability to reach its goal. The first would be the campaign’s end date in the beginning of January when the activity of everyone is significantly lower than in the other months of the year. Second of all, the financial goal did not reflect the capacity of the chosen platform, especially with regard to projects with a social dimension. Even though the project has reached only 30% of its funding goal, the campaign has, without a doubt, helped to promote BIVIO and the message behind the project. The time of the crowdfunding campaign has unfortunately run out, however, should you wish to support BIVIO, you can still do so by a donation via the project’s official website.